Amma stressed today the importance of employing a spiritual approach in checking global warming, cautioning countries across the world about the ill-effects of humanity’s continuing deeds against nature. Amma, who was invited for the daylong function by the Special Envoy for the Protection of the Planet of French President François Hollande, could not physically make it to the venue because she was concluding her seven-week American tour. 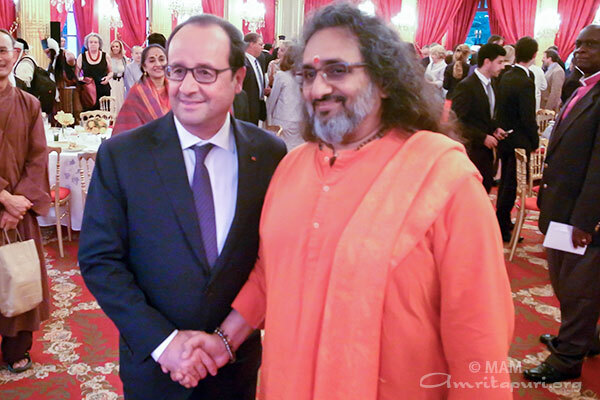 However, an audio-visual address of hers was delivered by her disciple Swami Amritaswarupananda. 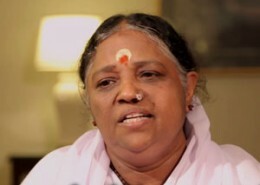 Swami Amritaswarupananda noted that the expertise of 62-year-old Amma’s global organisation, Embracing the World, in sustainable development and its longstanding history of interfaith cooperation has made it an important partner and voice in the conversation on how faith organisations may assist in modelling a pivot towards sustainable decision-making for the faithful, as well as for corporations, governments and society as a whole. Amma feels it is her responsibility as a religious leader to reawaken and foster such theosophical outlooks and thereby protect this planet—our common home. Amma has a unique approach to fighting climate change, blending conventional solutions such as tree planting with traditional approaches based on cultural and human values. Our organization, under Amma’s leadership is striving to bring the lost love and reverence towards nature back into people’s heart, thus impacting the community and the environment. In Amma’s values-­‐oriented elementary to high schools, many of the 70,000 students, ages 4-­‐17, plant a sapling each year and give it a name. Each morning, the children then water the plant and circumambulate it reverently. On the last day of school before the holidays, many of the children were overheard talking to their saplings, saying such things as, “During vacation, I won’t be here to water you. But don’t be sad. I will come back in two months. Don’t cry.” No one instructed them to do this; it was spontaneous. Having each child plant a sapling was such a simple thing, but what an impact it has had on those children. Our organization has undertaken the InDeed Campaign for Nature. Launched in Paris in 2012 by the actor and environmentalist Marion Cotillard, InDeed is helping people throughout the world to make commitments to protect the environment and reduce global warming. Through InDeed Campaign we have been able to organize the planting of more than one million trees since 2001, with people from 40 countries around the world participating. Amma has established a five campus university, ‘Amrita University,’ which has a student strength of 25,000. We have successfully conducted researches on landslides, Nano solar technologies, rainwater harvesting, sustainable agriculture, and smokeless stoves. The research on “microbial fuel-­‐cells,” was recently awarded the ‘Bill Gates Foundation Reinvent the Toilet Award.’ Another large-­‐scale mobilization is The clean India Campaign, started in the year 2010, which focuses on cleaning water sources, rivers, and villages, coupled with a strong sanitation awareness and waste management program. In recognition, to this outstanding effort, Prime Minister, Mr. Narendra Modi, requested the NGO to undertake construction of toilets for all the villagers living on the banks of the river Ganges as part of the Prime Minster’s ‘Clean Ganga Project’. Confronted with the massive problems of the world, we may feel our scope for impact far too miniscule. However, Amma says each of us is like a small candle. While a single candle is insufficient to vanquish the darkness, if all of our candles come together, there is no way we cannot triumph” Swami concluded. 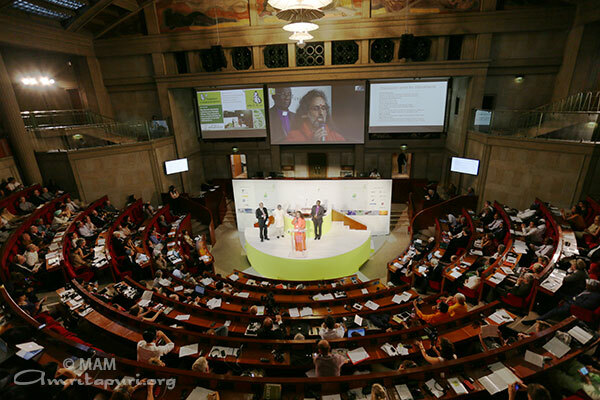 Overall, the Paris summit of the world’s major spiritual, religious and moral leaders emphasized the urgent need for a strong universal appeal and support for effective policies prior to the COP21 conference taking place in the French capital later this year. 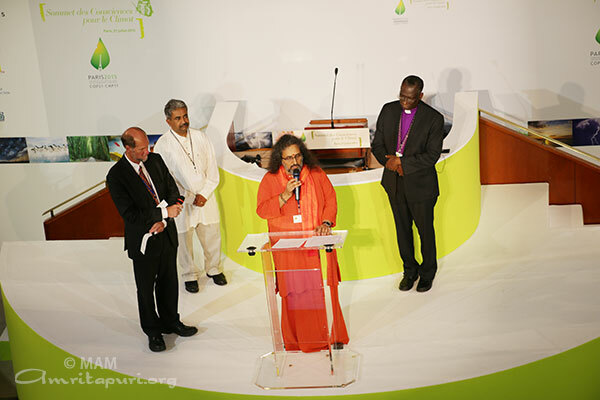 Among other leaders who attended the summit were Bartholomew I, Archbishop of Constantinople and Ecumenical Patriarch; United Nations former secretary-general M. Kofi Annan; Nobel peace laureate Dr. Muhammad Yunus; Buddhist leader Thich Nhat Hahn (represented by Sr. Chân Không); Sheikh Khaled Bentounes, who is the spiritual guide of the Alawiyya Sufi brotherhood (Algeria); Philippines Senator Loren B. Legarda; UNESCO Director-General Irina Bokova; Pontifical Council for Justice & Peace President Cardinal Peter Turkson; American Jewish Committee Director (Interreligious Affairs) Rabbi David Rosen; Brazilian politician Marina Silva; former Ireland president Mary Robinson, who is Special Envoy of the Secretary-General of the United Nations for Climate Change; and M. Janos Pasztor, who is Assistant Secretary-General of the UN on Climate Change.